Katie at House of Four made this super cute pumpkin as part of a challenge. I love the rock n roll looks on this stud pumpkin. We all love a bit of bling don’t we? I think pumpkins are no different. 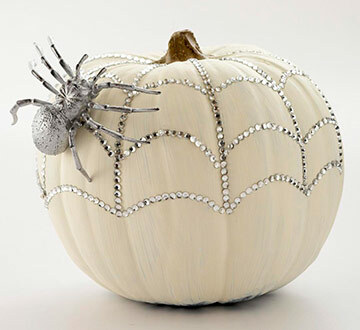 Better Homes and Gardens share this tutorial for a faux web pumpkin made with rhinestones. Now I love the looks of these pastel papers. They work very well with the pumpkin don’t you think. This is a brilliant idea from Courtney at Crafts by Courtney. It took only some paint and some sharpie pens for Sara to achieve this bright and cheerful look. She tells us how she did it on her blog Confetti Sunshine. I had to mention this post from A Beautiful Mess packed with easy ideas, none of them including any carving, yeah! Stencils, leaves, studs, paint, ribbons, you’ll get lot of inspiration from this! Not sure which idea I’ll try first (though I have a slight obsession with studs lately). So what do you plan to do with your pumpkins this year? These are gorgeous, lots of great inspiration. Thanks Jenny, I hope it does!